Lentibulariaceae is a family of plants, sometimes called the 'bladderwort family'. 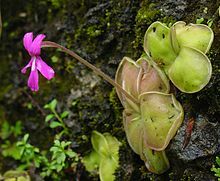 It only has three genera: Pinguicula, Genlisea, and Utricularia. They are all carnivorous plants (plants which trap and digest insects). They are in the order Lamiales. This page was last changed on 13 July 2018, at 09:36.